I explained that successfully untying a yoyo had nothing to do with gender. This blew up in to a fiery argument. Upon reflection I realised her sexist outburst was caused by their bedtime story. Elijah, 4, is going through the superhero phase, so naturally selected a superhero book from the library. 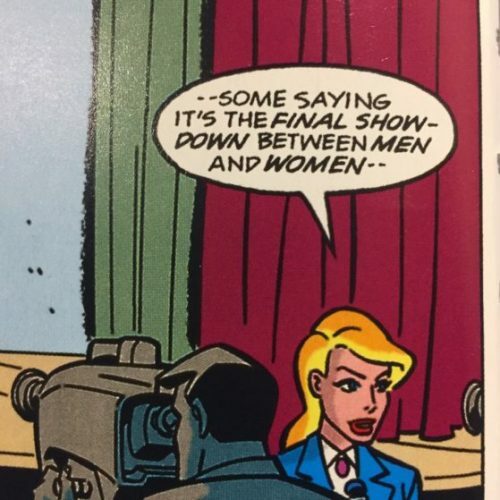 In a nutshell, a female ‘baddie’ called Livewire gets sick of men ‘dominating the world’ and uses her superpowers to make all the screens show static when a man appears on the TV. So this forces everyone to only allow women to read the news. Superman and Livewire get in to a brawl and Lex Luthor zaps all the power out of her with his latest invention. The screens return to normal, and a male anchor asks the fill-in female anchor for the microphone back, so that he can return to reading the news as normal. She reluctantly hands the microphone over and he says “thanks babe”. The End. Ha. 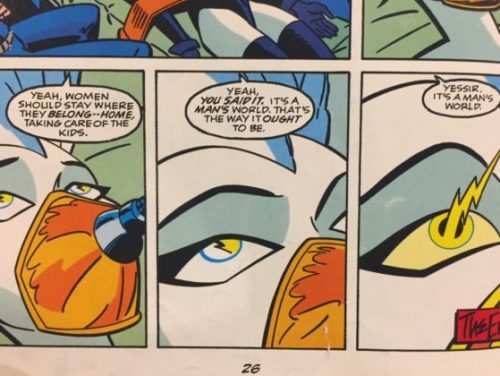 This story had influenced my daughter, hence the sexist comments directed at her brother.From my experience it is evident that what our kids think about determines their actions. Studies prove that violent video games make children violent. Years ago I read The Twits by Roald Dahl to my kids, and later that day Kale, 5 years old at the time, got angry at me and passionately yelled, “YOU OLD HAG!” I had to hide in another room to laugh. I also noticed when Ashleya was younger and reading lots of Enid Blyton books, she would communicate with old English speech. Have you ever noticed the times when your kids have been influenced by something they have watched or read? I looked up ‘food for thought’ in the dictionary, and found that a synonym for this term was ‘mental nourishment’. Generally we only think about the physical nourishment of food, and trying to make sure our kids eat healthily. But what about their ‘mental nourishment’? What are we feeding their minds? If we feed our kids junk food, they are going to be physically unhealthy and get sick. If we feed them wholefoods they’re going to be healthy. It’s the same with mental nourishment. 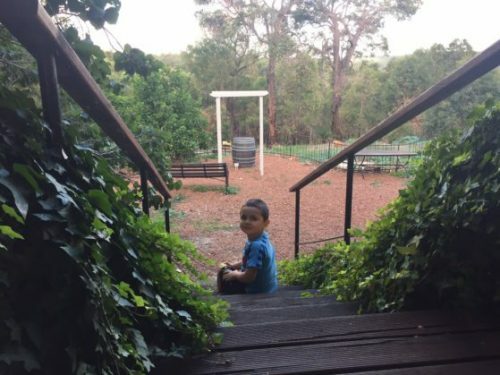 If we feed our kids’ minds with ‘junk food’ all the time, they’re going to be mentally unhealthy and it will manifest though their words and actions. On the flip side if we feed their minds with goodness, it will play out through more positive behaviour. Eighty per cent of the time we eat healthily at home, and the other 20 per cent of the time when we’re out with other people we eat whatever is put in front of us. I’ve taken the same approach to ‘mental nourishment’. At home, I limit my kids’ media consumption. We don’t have a TV aerial, and they only use the internet for homework after school, then the screens are off. I also try to be mindful of what they are reading and the music they are listening to. 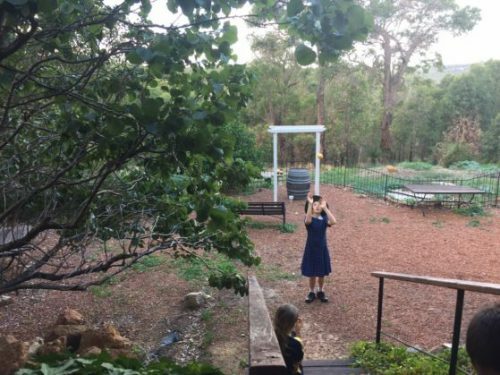 At home, with my primary school aged kids, I’m in control of what is going in to their minds. I know this will dramatically change when they are in high school. What is your child’s mantra? I DO NOT want those words to be my child’s mantra! I explained to Jewel that was a catchy song, but the lyrics weren’t true. The truth is, that if you do the wrong thing, you will have bad consequences, and if you do the right thing, there will be good consequences. Also, if you do things that kill you, you will be dead, not alive! I didn’t download the song. But at her birthday party we played musical statues and she asked if I would play the song ‘Counting Stars’ for the game. I said yes and played it via YouTube. 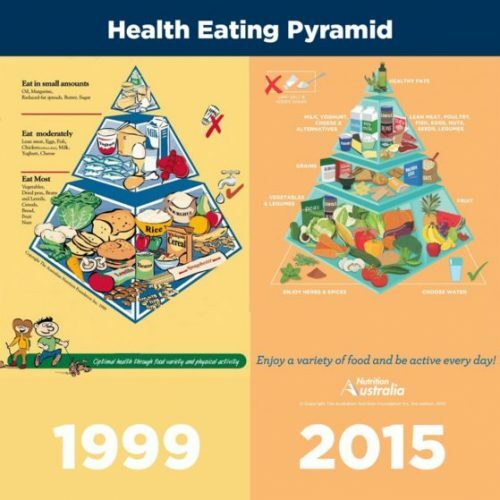 We have all heard of the health eating pyramid for our bodies, which has changed over the years. 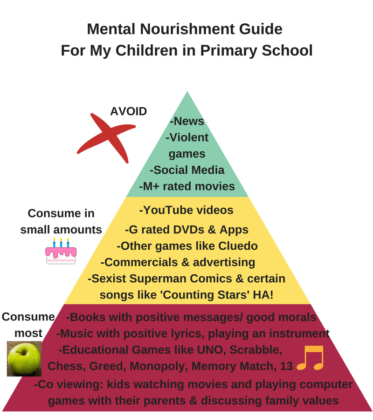 What about a food pyramid for our minds for mental nourishment? So this is my ‘mental nourishment’ guide for my family. Just as each family eats different kinds of food to suit their needs, each family would consume media differently. I’m aware that media consumption affects the way my children behave, so I’m going to be mindful of what they consume. As kids grow we need to adapt, so I’ll re-evaulate my pyramid when my kids are in high school. What are your kids’ minds feeding on? Also, have you thought about what you are feeding your mind with? Just like you eat dinner together, consume media with your child so you can talk about family values, like with Jewel and the Counting Stars song. Check out the Australian Council on Children and the Media and see if your kids’ media consumption lines up with their fact sheets. Maybe we need to start ‘contemplating thinking about thinking’ like Robbie Williams.